The rules for this egg fast are pretty simple. Pin the image I created so you can easily find it if you need to. Eat a minimum of 6 eggs per day. Eat one tablespoon of healthy fat (butter, mayonnaise, coconut oil, etc.) per egg. Enjoy up to 3 ounces of cheese per day. Within 30 minutes of waking up, eat your first egg. Eat an egg every 3 to 4 hours. Add salt whenever you can (electrolytes are important!). Condiments and spices are OK to add (hot sauce, pepper, paprika, etc.). You can drink Diet Soda, but a maximum of 3 a day. 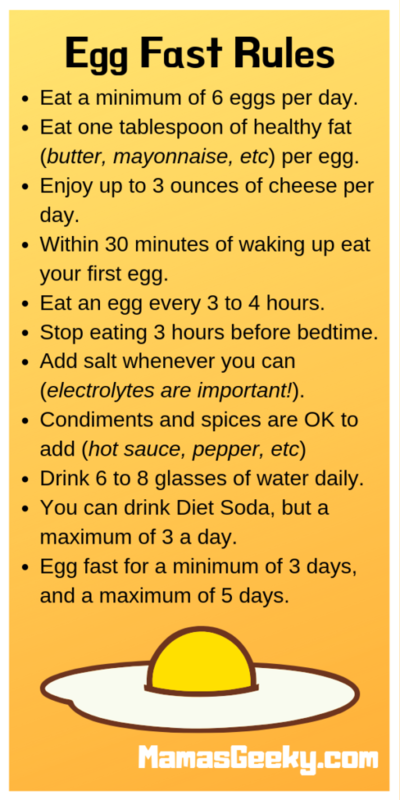 Egg fast for a minimum of 3 days, and a maximum of 5 days. We at first planned on doing 3 days, but then had the bright idea to do Monday through Friday, so 5 days total. To prepare, we hard boiled 2 dozen eggs, and purchased another 3 dozen. We made some deviled eggs and egg salad, since mayonnaise is a healthy fat that we were allowed (and encouraged) to have. I shredded two full blocks of cheddar cheese (if you didn’t already know, the pre-shredded stuff can have hidden carbs so be careful) to use for omelettes and scrambled eggs. The night before we made one of our favorite meals (keto Sausage Stir Fry) to hopefully stop any cravings – and we were ready! There aren’t a lot of meal options when you have such strict guidelines that basically only includes eggs, or so I thought. We actually found a wide variety of foods to eat and enjoy. The main thing I would suggest is try to switch it up throughout the day. Having something different for breakfast, snack, lunch, and dinner can stop you from feeling like you are eating the same thing over and over for 5 days. Remember, you can have up to 3 ounces of cheese per day, so we tended to eat one or two cheese sticks per day as well. Now, I really should mention that I was doing the 21 Day Fix workout while on this fast as well. Of course, I was not following the eating rules (honestly, I never have and I have done this workout many times). DAY ONE: No cravings all day. DAY TWO: I was down 2 pounds which had me over the moon and helped me curb any cravings. DAY THREE: Down another 2 pounds and I could not believe it. Minimal cravings for other foods. DAY FOUR: Down 1.5 pounds and the cravings subsided. I was actually looking forward to the next egg. DAY FIVE: Down another pound! Yes! The cravings were real this day, likely because I knew it was just about over. On the morning after my 5 day egg fast, I was down a grab total of 7.5 lbs! Not too shabby if you ask me. After a full weekend of back to regular keto eating, I was maintaining (and even down another half a pound). Overall, this egg fast was a lot easier than I thought it would be and is something I plan to do every 2 months or so. Can you eat anything else with this diet, such as veggies? Just cheese and healthy fats. Unfortunately no veggies. But an omelette with butter (or mayo) and cheese is still yummy! Good luck if you decide to try it for a few days! Ok...real TMI question...how bad was the gas on this fast? I really should add a section about this. It was almost non existent, between my husband and myself. Crazy, I know. Did you drink any diet soda? I think having one a day would help me push through as well.